Today a son remembered his father, a man whose footsteps he followed in. Today we laid to rest the 41st President of the United States. After three days of funeral events in Washington, Bush was headed home to Texas for more ceremony and then his burial Thursday. After the cathedral service, the hearse and a long motorcade drove to the National Mall to pass by the World War II Memorial, a nod to the late president’s service as a World War II Navy pilot, then arrived at Joint Base Andrews. His arrival in Washington, DC was greeted with the roar of cannons and the breeze from the Potomac. Before leaving Texas his service dog was captured Sully was captured lying next to his owner in the funeral home. The cathedral was filled to capacity as the current President greeted 4 past sitting presidents. The reception was noted as chilly because of recent remarks made by the current president. 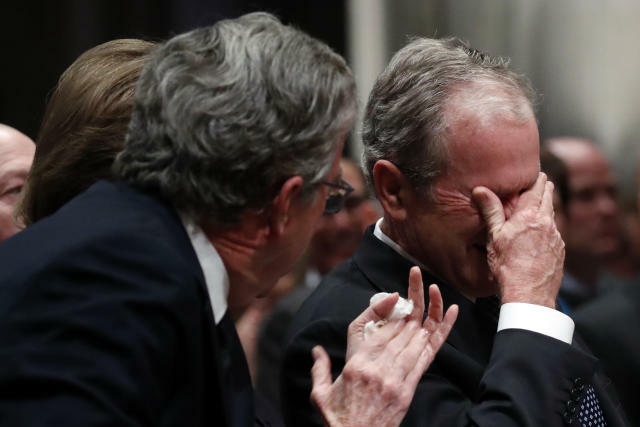 It was noted that Bush made it a point to invite Trump to the funeral because he could not see ousting a sitting president even with the tension between the two.